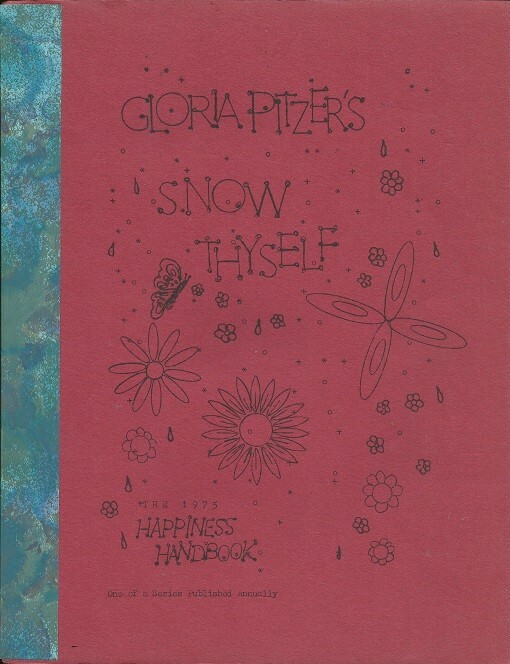 Other publications written, illustrated & self-published by Gloria Pitzer that are not cookbooks. 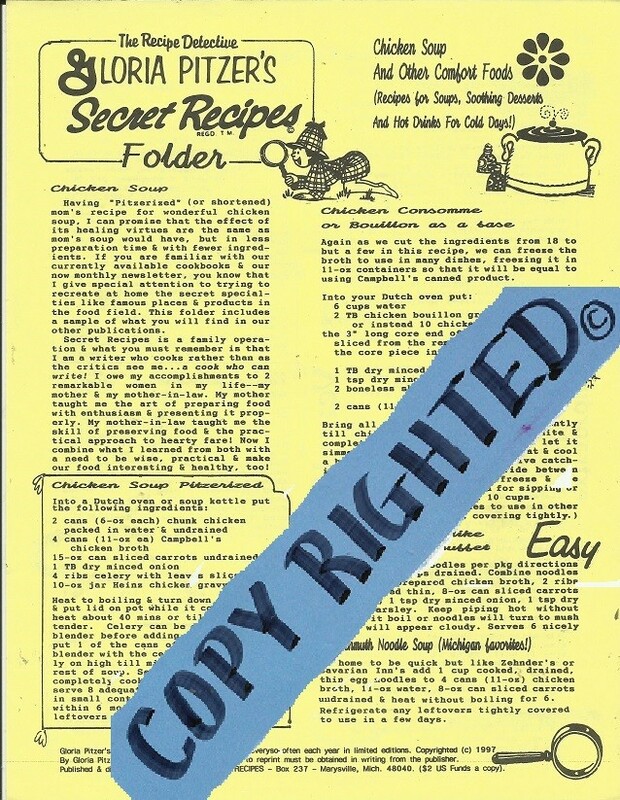 1997 – Gloria Pitzer’s Secret Recipes Folder – Chicken Soup & Other Comfort Foods was written, illustrated and published by Gloria Pitzer (Secret Recipes, St. Clair, MI). NO LONGER IN PRINT – this was an 8.5” x 11”, 6-page folder of perfect soup and comfort-food recipes for the cold, winter-weather months. 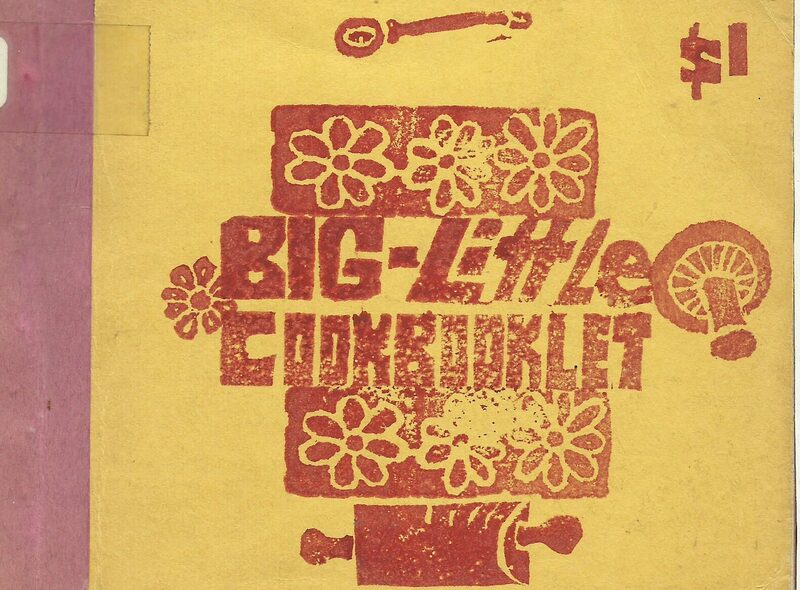 It sold for $2 a copy until 1999, when the folder was down-sized to 4-pages, which included 29 recipes. 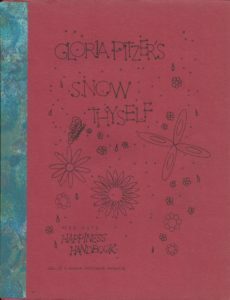 This edition of the folder sold for $1.50 each until it sold out in the Fall of 2000; during which time Gloria started developing a series of “Bulletins” in a similar fashion. 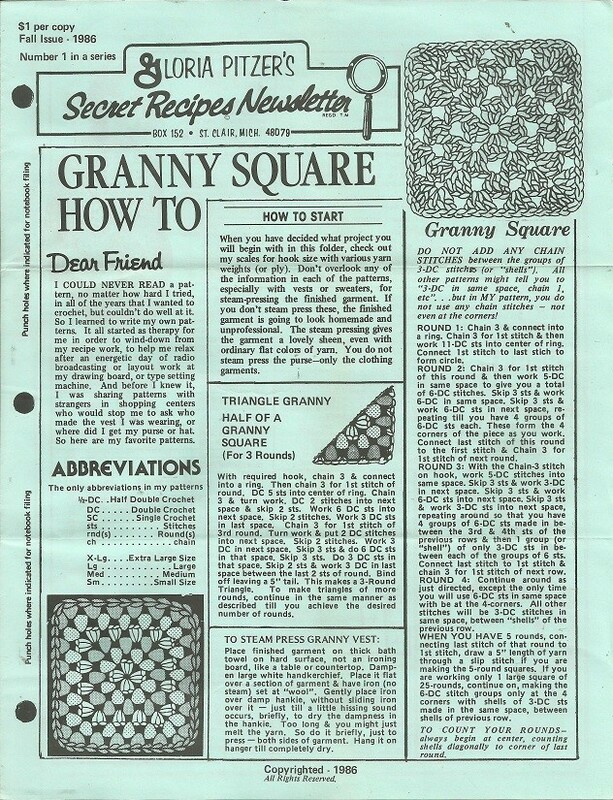 1986 – Granny Square How To was written, illustrated and published by Gloria Pitzer (Secret Recipes, St. Clair, MI). 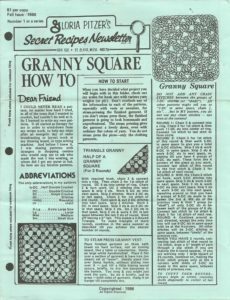 NO LONGER IN PRINT – this 4-page folder of crochet patterns and projects (for vests, sweaters, purses and hats) had an 8½“ x 11” format and sold for $1 a copy. It was meant to be “Number 1 in a series” that could be collected in a 3-ring binder, like the Gloria Pizer’s Secret Recipes Newsletter. However, the series never came to fruition as Gloria had a number of other publishings happening at that time as well. Thus, the project was put on a back-burner, to simmer. I have not found any other issues to the series. 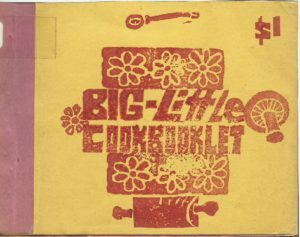 1974 – The Big-Little Cookbooklet was a small-sized booklet written, illustrated and published by Gloria Pitzer (Happy Newspaper Features, Pearl Beach, MI) & was part of a limited series called “Dumb Little Cookbooks – Reliable Recipes for Reluctant Cooks” from Gloria’s Homemaker’s Newsletter. NO LONGER IN PRINT – This book has a 5.5” x 4.5” format of 48 pages with 22 recipes for low & no sugar dishes, desserts, main dishes, salads and side dishes. The booklet also has 15 “write-your-own-recipe” pages, plus extra “cook’s notes” pages. The booklets were assembled and decorated by hand and sold for $1 each. 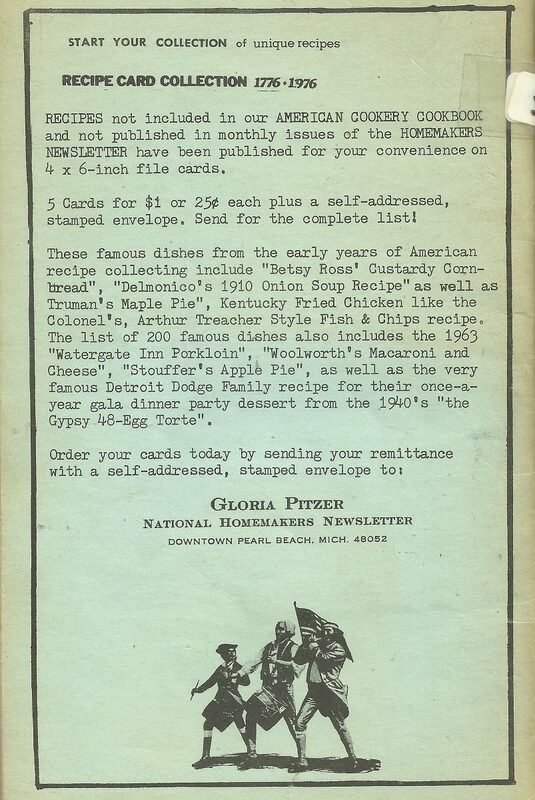 1974 – Gloria Pitzer’s Homemaker’s Newsletter – written, illustrated and published by Gloria Pitzer (Happy Newspaper Features, Pearl Beach, MI) – started as “a monthly compendium of fact and fancies”, as Gloria referred to it, adding that it was “the almost-magazine…not quite a newspaper…that can build into a book.” NO LONGER IN PRINT – this was, originally, a small, 3-ring binder-style publication, printed in a 5.5” x 8.5” format with 12 back-to-back pages packed full of “food for the table and food for thought”, household tips, humorous quips and cartoons; plus, a “Readers Swap Shop”. 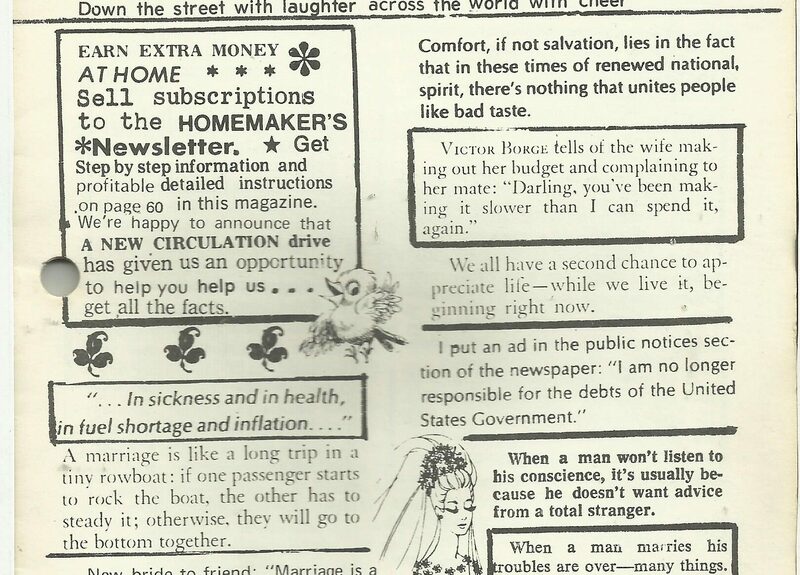 The newsletter originally sold for $0.50 per issue, as well as $2.75 for a 6-month subscription or $5 for a 1-year subscription. 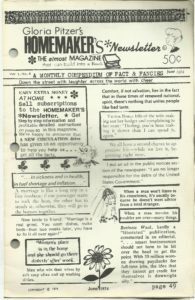 Over the decades, the newsletter evolved with the changing times – the name slightly changed a few times, as well as the size and number of issues printed in a year; plus, of course, the cost grew with inflation too. By 1976, it was being published monthly in an 8.5” x 11”, 10-page format and sold for $0.50 per copy or $6 for a 1-year subscription. 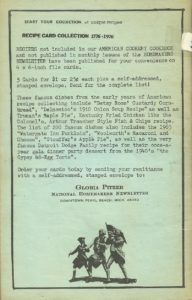 By 1978 the name slightly changed to Gloria Pitzer’s National Home News Magazine, though the format remained the same; and it sold for $7 per 1-year subscription. 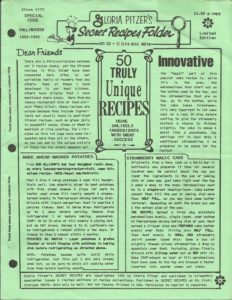 In 1980, Gloria Pitzer revised the newsletter again, getting right to the heart of cooking – reducing the number of ingredients to comply with your time and, most of all, your budget. While the format size remained the same, the name was changed to “Gloria Pitzer’s Monthly Cookbook of Secret Recipes”. Each copy contained about 100 recipes and sold for $1 per issue, or you could subscribe for a full year. 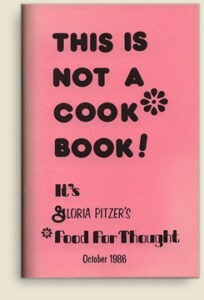 Starting with the Summer issue of 1984 (Jul-Aug-Sep), the newsletter was published quarterly under the name Gloria Pitzer’s Cook’s Quarterly, still in an 8.5” x 11” format with up to 20 pages full of “Food for Thought” & “Thoughts on Food”; plus, household hints, short cut cooking tips and recipes for imitating favorite restaurant dishes and grocery products at home. It sold for $10 per 1-year (4 issues) subscription or $2.50 for a single issue. 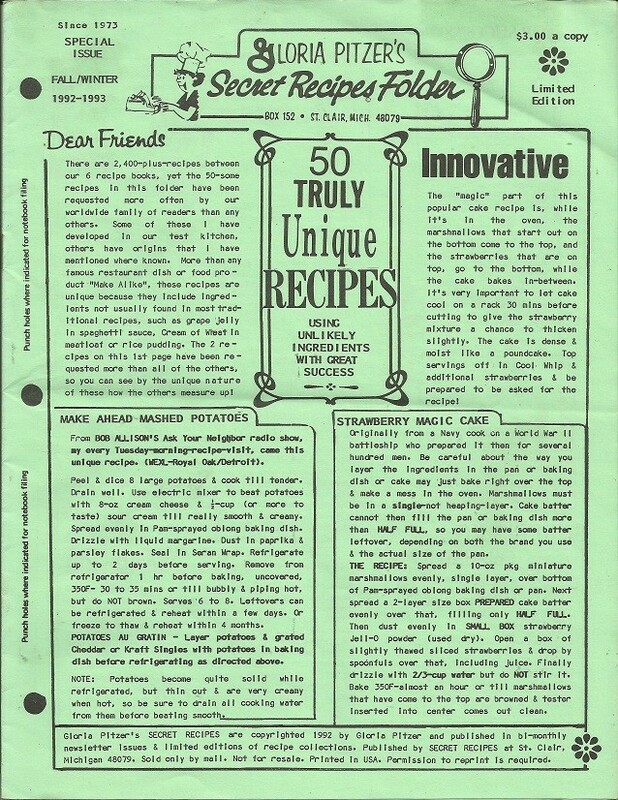 By 1986, the newsletter was being published every 2 months under the name Secret Recipes Newsletter. 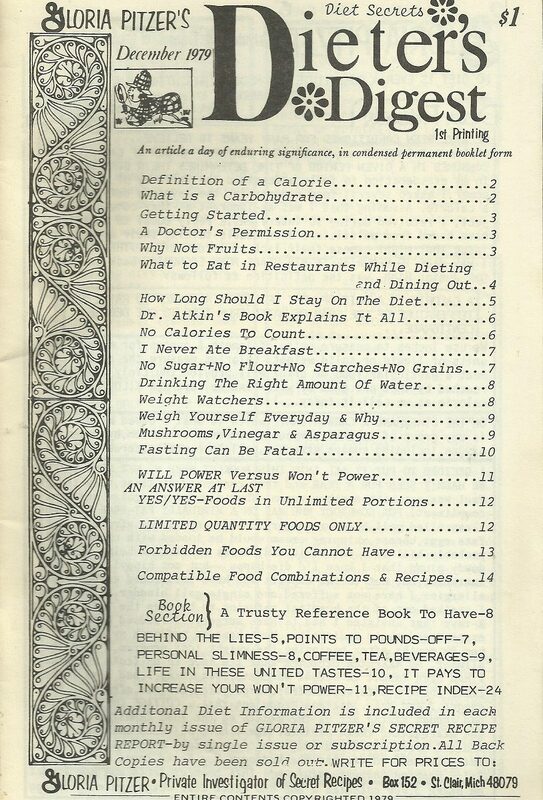 Still in the 8.5” x 11” format, the 12-page publication boasted at least 50 recipes per issue along with humorous stories, “Food for Thought” and news on nutrition, restaurants and product reviews. It continued to sell for $10 for a 1-year subscription of 6 issues (or $2 per single copy) until 1989, when the price was raised to $12.50 for a 1-year subscription (or $2.50 per single copy). Then, in 1991, the price went down to $12 per year and $2.50 for single copies. The bi-monthly newsletter was temporarily retired after the March-April 1994 issue. 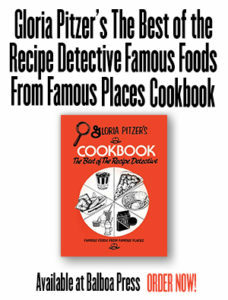 However, in 1995, the publication was back by popular demand under the name Gloria Pitzer’s Secret Recipes Quarterly for $16 per year (4 issues) with 20 pages per issue; each issue featured at least 75 recipes for imitating famous restaurant dishes and grocery products at home; plus, more “Food for Thought”, household hints and cooking tips. But, by 1997, the publication went back to the bi-monthly, 12-page format under the old name, Gloria Pitzer’s Secret Recipes Newsletter and sold for $16 per 1-year subscription (6 issues) or $2.75 per single copy. 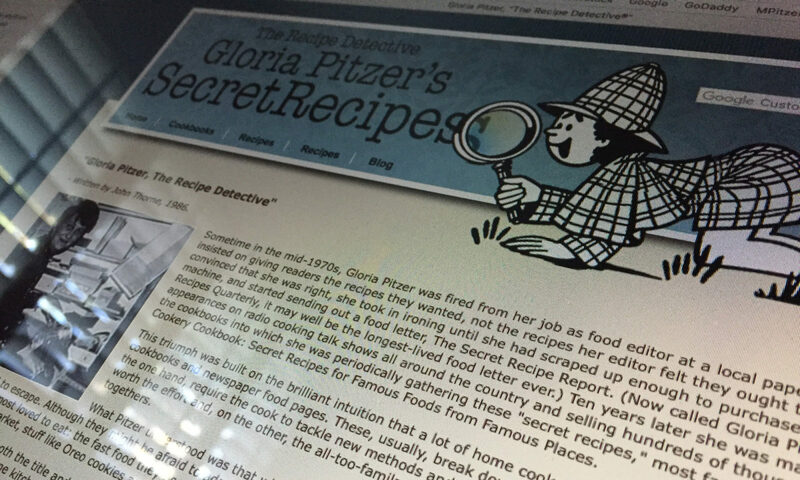 In January 1998, the newsletter went back to being a monthly publication with the name shortened to Gloria Pitzer’s Secret Recipes. 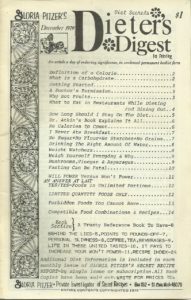 The 8.5” x 11”, 8-page format was still full of “Food for Thought”, household hints and tips, famous restaurant recipes and grocery products you can make at home. During its last year of publication, it sold for $18 per 1-year subscription or $2 per single copy. It was permanently retired, after 27 years, with the December 2000 issue.